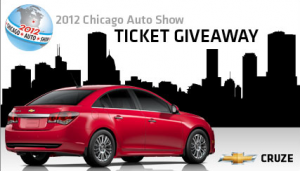 Free Chicago Auto Show Tickets from Chevy Dealers | A Savings WOW! The Chicago Auto Show is just around the corner and you can get a free pair of tickets to it just by filling out a short form and bringing the confirmation to your nearest participating Chicagoland or Northwest Indiana Chevy dealer. These usually go fast, so we recommend calling your Chicagoland or Northwest Indiana Chevy dealer first to make sure they still have some before heading out! Find out more information about the Chicago Auto Show.